Taking the partner for granted is a common enough condition that plagues many a marriage, perhaps more so an arranged match, where the gender roles are drawn by tradition; the man goes out to work, the woman looks after the family. However, in Harish Vyas’s Angrezi Mein Kehte Hain, the husband is inexplicably grumpy, and the wife equally inexplicably docile. Yashwant Batra (Sanjay Mishra) living in an ancestral mansion on the banks of the Ganga (gives the film a touristy-exotic look), is a postal employee, married to Kiran (a luminous Ekavali Khanna) from a wealthy family. The unattractive groom from a lower economic stratum was chosen for his ‘sharafat’ (decency), not for his looks or temperament. Batra goes to work sullenly demanding his tiffin, comes home, petulantly demands ice for his drink, eats and sleeps. Apparently, they never went on a honeymoon, take no holidays, have no social circle apart from her family, that he dislikes. He never expresses appreciation, never mind love; and for some reason, Kiran puts up with his odiousness. It’s when he tries to push his daughter Preeti (Shivani Raghuvanshi) into the same arranged marriage trap, the feelings buried for twenty-four years are articulated by Kiran, and it results in her husband brusquely asking her to leave his house if she is so unhappy, and she does. The film till this point is engaging enough, it’s when Batra tries to woo his wife, the script becomes laboured and the man a caricature. To contrast with Batra’s crustiness is the jovial neighbour (Brijendra Kala) whose son Jugnu (Anshuman Jha) Preeti loves, and in a small cameo, Pankaj Tripathi in a treacly subplot about a man who believes in “love marriage and marriage love” and tends to his terminally ill wife (Ipshita Chakroberty). If Tripathi and Mishra’s roles were swapped, the film would have been quite different. 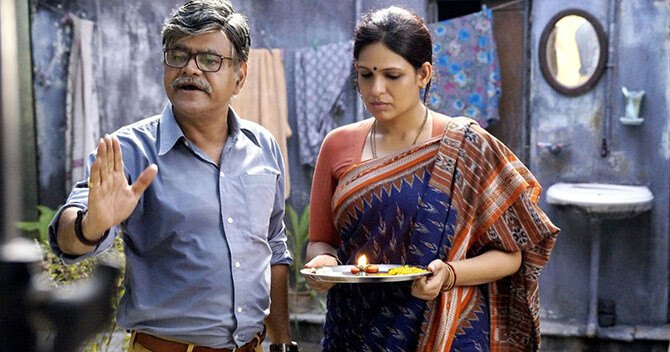 Sanjay Mishra is a good actor, but incapable or portraying romance, whereas Tripathi would have done a better before-and-after personality change. At its heart, Angrezi Mein Kehte Hain is conservative. A woman is told she cannot exist without a husband, and for all her fiery defiance of her father, Preeti remains a housewife and caregiver to her father. Which leaves the viewer with the thought, will she turn into her mother in twenty-four years, or will Jugnu’s demonstrativeness save their marriage? If the film is unsatisfying it is because it does not expand sufficiently on the potential of the idea.